An NPO started up 1985 and an artist-run centre since 1990, DARE-DARE had occupied several gallery-type spaces when in 2004, it elected DIS/LOCATION as its modus operandi and set up offices in a mobile shelter, which it subsequently parked in various public spaces, making the city itself the canvas for its research and dissemination activities. 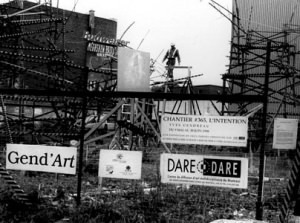 In 2004 DARE-DARE decided to make tangible the theories about the appropriation of public space that its members had been elaborating upon for several years. From that moment on, the artist centre focused its programming exclusively on public art projects, disseminating interventions throughout the city from its base of operations, successively located at: Square Viger (2004-2006), the park with no name (2006-2008), Cabot Square (2008-2009), Walter Stewart Park (2009-2012), St-Laurent metro station (2012-2015) and Atwater Market (2015-2018). This nomadic research was conducted from a variety of neighbourhoods, each with its own rich tapestry of social, political, environmental, economic, historical and urban issues. It provided the ideal structure for meeting the dissemination needs of artists and engaging the public and surrounding community in meaningful dialogue. By inserting itself within the fabric of daily urban life, DARE-DARE contributes to making art known to various people from all walks of life. DARE-DARE owns the mobile shelter, which is currently strategically located next to Atwater Market and Lionel-Groulx metro station. In 2016, the centre acquired a shipyard container in which it set up a documentation centre which in 2017 was christened HALTE — Pavillon de référence et de réflexion sur l’art dans l’espace public [Pavilion for Reference and Reflection on Art in Public Space] and whose purpose is to serve as an open-air public library specialized in contemporary art and various urban issues. 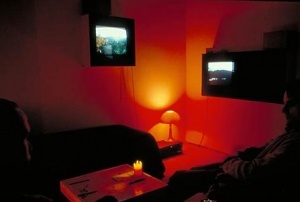 Rather than build on the neutrality of the gallery’s context, these new practices reconfigure the framework of artistic experience and deploy themselves within the public domain by drawing on the context, which is invariably loaded with meaning and connotations, inhabited and perpetually changing. Within the context of each and every of its dis/locations, DARE-DARE has articulated its programming around a theme echoing a contemporary societal issue—or more specifically—an issue in line with its current surroundings, be it related to: heritage, itinerancy, social justice, green spaces, urban infrastructures and quality of life, interculturalism, social and generational mixity, speculation, gentrification, civic friendliness, etc. This first option consisted in the adoption of a stealth strategy. Our aim was to reach out to a diversified audience of people who were uninitiated and unfamiliar with, not to say wary of arts organizations. Not only was its asking price very modest, allowing us access to ownership while significantly reducing our operating costs, the mobile shelter afforded us the ideal vehicle for incognito infiltration of the urban fabric with an aesthetics characteristic of your typical construction site mobile office. Within the collective mind, a mobile shelter is a harbinger of change and innovation, arousing curiosity. Likewise, DARE-DARE wishes the artist centre to be perceived as playing an active role as a social player and agent of development in the city. Second grounds for research: occupy areas of power, perturb the entertainment-oriented, preformatted cultural offering. In an attempt to breach the gap with larger cultural institutions, the centre decided to move downtown. The initiative was successful; curious visitors came to our offices every day to learn more about our mission and the activities on our program. For many, it was their first contact with contemporary art. In order to make manifest our openness as well as our artistic mandate, DARE-DARE decided, by means of a collective graphic intervention, to give the trailer a makeover, its anonymous aspect being perceived as somewhat too austere and official-looking to non-initiates. DARE-DARE then went on to acquire a shipyard container in which it set up HALTE — Pavillon de référence et de réflexion sur l’art dans l’espace public [Pavilion for Reference and Reflection on Art in Public Space]. In addition to its regular programming, special events addressed specific issues related to new artistic practices: Odyssée (2004-2014) (an historical sightseeing tour), 2014, Viva! Art Action (an international action and performance art biennial ) 2017, 2015, 2013, 2011, 2009, 2006, SATELLITE – Detroit/Tijuana (transborder residencies) 2011, Écocité sur le terrain 2011 and Fête des fleurs 2007 (citizen art and ecology), Périmètre 2005, Autour de l’Agora 2006, (art intervention in public space) Mémoire vive in collaboration with the Centre d’histoire de Montréal 2002 (contemporary art and heritage), L’algèbre d’Ariane with the Centre Les Brasseurs de Liège, Belgium 2002 (relational aesthetics and participation).